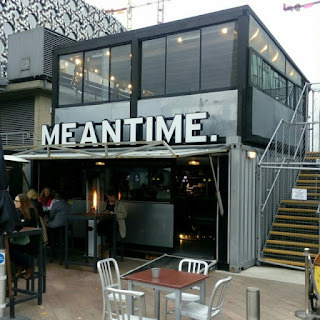 So a few days after meeting the ‘Make Time For it’ artists and enjoying their works – that list of artists includes brewer Ciaran Giblin, of course – I found a few hours to wander over to the Millennium Dome and see the results in all their glory in the completed pop-up pub. And what a sudden dose of reality it was. Walking up, I could see the ‘pub’ was basically an 8’x6’ shed – B&Q or Wickes, it’s hard to tell – painted white and with furniture plonked in it. It was parked under the roof of a walkway, so I guess they weren’t too confident in its ability to withstand the London rain! Inside was a friendly welcome and good beer. It all looked a bit thrown-together though – for instance, the tall taps on the bar were purely decorative, with the two beers actually coming from a portable keg unit on the floor behind. The neon lights sat awkwardly on the bar-top, and the hand-made glasses were glued to a shelf to prevent theft. The gorgeous mirror hung unremarked in a corner, and the special bench was hard to see in such a small space. The two artworks readily visible were the intricate wallpaper and the tailored waistcoat, but of course the latter had to be worn by whichever barperson was serving – and sadly its cut wasn’t so flattering on the lady who was on duty when I visited. I also learnt a bit more about the ‘new’ Meantime. The pilot brewery there, funded and installed last year by previous owner SAB-Miller (which sold Meantime, Peroni and Grolsch to Asahi in order to get approval for its merger with AB-InBev), has been brewing an experimental new beer every other week this year. This is where the six artist-collaborated beers came from, and several more one-offs were on sale nearby in Meantime’s Beer Box, which is a couple of shipping containers converted into a bijou craft beer bar. 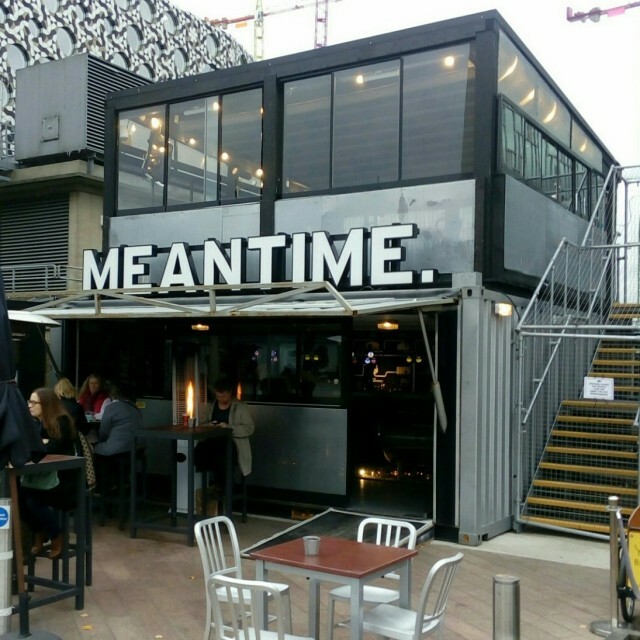 In addition, I discovered that while the SAB-InBev deal only completed this October, the sale of Meantime and the others took place several months earlier. Apparently the new Asahi employees each received a welcoming pack of sample beers from around the new Asahi empire. I can well imagine the scene as they opened them – a Eurolager from here, a Eurolager from there, and – oh look, another Eurolager. Yummy! Incredibly annoyingly, I can’t find any of the photos I took during my visit, although I do have a couple of the Beer Box, so in the mean time here’s one of that. Sigh.